Projection is a simple and somewhat ironic portrait of the artist. 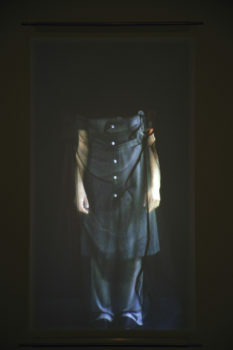 Tan filmed herself in her studio, projected the moving image onto a bed sheet and then refilmed this set up. The portrait on the fluttering sheet is diffused and continually disturbed and when projected onto a small free-floating screen in the gallery space the result seems like an optical illusion and rather ghost like.